Earlier today, Baseball America released the Washington Nationals’ Top 10 Prospects along with detailed scouting reports on each player. Here is the list along with a note on each player taken from the article. The Nationals rave about his maturity, humility, competitiveness and diligent work habits…With a rare combination of stuff, size, feel for pitching and makeup, Giolito has superstar potential. Taylor can provide value even if he never hits for average, because his other tools are loud. He could become a solid everyday center fielder, and he has all-star potential if his bat takes another step forward. 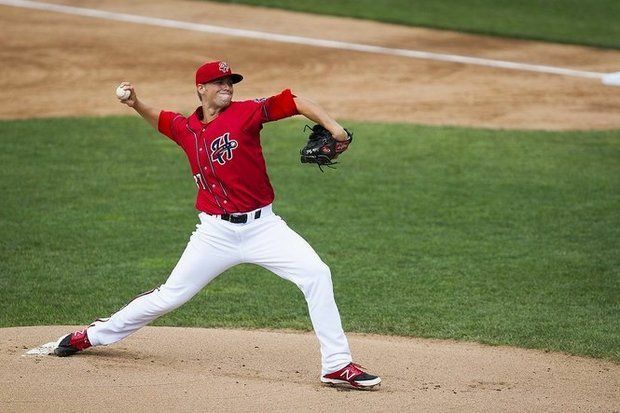 Fedde has advanced command of his fastball for his age, and he is a groundball machine…Fedde’s recovery from Tommy John surgery is progressing according to schedule, and he probably will make his pro debut some time in 2015. His plus raw power plays in games because he excels at driving balls into the right-center field gap, and the Nationals would like to see him pull the ball with authority a bit more…He also has slightly above-average speed and is a smart baserunner who likes to steal bags. Cole’s fastball was not quite as overpowering early in 2014 as it had been in the past, but he still pitched comfortably at 91-93 mph with decent life and bumped 96…Cole figures to spend the spring in big league camp for the second straight year and open 2015 back in the rotation at Syracuse. He has very good first-step quickness that translates to above-average range at either shortstop or second base, and his slightly above-average arm plays at either spot…They could push him in 2015, now that he’s on the 40-man roster, with a likely assignment at high Class A Potomac and a chance to play his way to Double-A Harrisburg. Ward’s calling card is his lefthanded bat. He has good feel for his barrel and can spray hard line drives from the left-center field gap to the right-field line….Ward has a chance to hit enough to become an everyday first baseman down the road, assuming he outgrows the hot corner as most evaluators expect. He followed a lackluster 2013 with a horrific 2014 campaign at Triple-A Syracuse that ended on July 1 when he tore the labrum in his left shoulder sliding into second base…The Nationals have been trying for years to get him to stay in his legs and let his hands work for him, but he can’t break the habit of pulling his lead shoulder and lunging. Pivetta has a physical frame and a long, loose arm action that produces easy velocity. His fastball sits at 92-94 mph and bumps 96. It is very effective when he repeats his delivery and pitches down in the zone with good angle…Pivetta’s mechanics and command remain works in progress, but he has upside as a potential mid-rotation starter if he can continue to progress. ** After the trade that sent Souza to Tampa, BA slots the returning players Trea Turner and Joe Ross at #2 and #6 respectively. This pushes AJ Cole (and everyone after him on the list) down one spot. Then at 3:00 BA writer Aaron Fitt went in an online chat to discuss the list and those players that missed the cut. Here are some snippets on other noteworthy former and current Senators along with players slated for City Island in 2015. This entry was posted in Uncategorized and tagged A.J. Cole, Austin Voth, Baseball America, Brian Goodwin, Drew Vettleson, Drew Ward, Erick Fedde, Erik Davis, Harrisburg Senators, Jason Martinson, Joe Ross, John Simms, Lucas Giolito, Matt Purke, Matt Skole, Michael Taylor, Nick Pivetta, Pedro Severino, Rafael Bautista, Reynaldo Lopez, Sammy Solis, Steven Souza, Taylor Hill, Tony Renda, Trea Turner, Victor Robles, Wilmer Difo. Bookmark the permalink.